Pictures: (L)Thomas Jeremy and Jeremy at the G-Force Booth. (R) Just an idea of how big this show is. 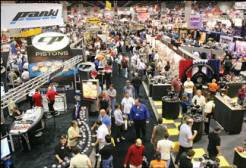 While the racing season is over for the 2010 the racing business continues this weekend as the Moose heads to the Performance Racing Industry trade show in Orlando. 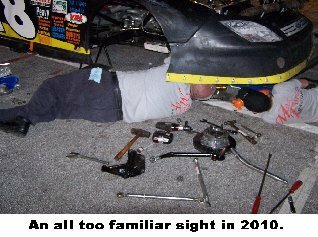 We�ll post more pictures from the 2010 Snowball Derby on our web site www.maxforceracing.com this week. Thomas Praytor Snowball Derby 2010: The final piece of Derby prep was applying the stickers celebrating the life of Mobile International Speedway Announcer and long time sports broadcaster, Jim Koblas. The design is the traditional NBC Peacock in black instead of it�s normal rainbow of colors with KOBLAS IS SPORTS in gold. Gold because Jim was the Gold Standard for sports broadcasters on the Gulf Coast. . Parking for the late models haulers is Wednesday followed by the green flag party Wednesday night at 5 Flags. We�ll also broadcast Fausak Tires Inside Alabama Racing from the track Wednesday night at 6:00. On track activities start on Thursday. 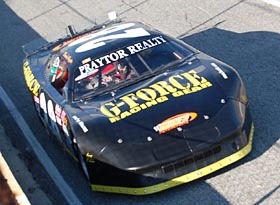 Thomas Praytor 11-27-10 Snowball Derby: Long time sponsor G-Force Racing Gear returns as the primary sponsor for this years Snowball Derby. �I�ve never worn anything but a G-Force suit and the guys at G-Force have been really good to our race team,� said the Moose. �In today�s climate it takes multiple sponsors to keep taking great race cars to the track and the folks at G-Force have been with me since day 1.� The team left the Derby�s open test with a solid car in race trim and had the track rented Saturday with several other teams to work on qualifying. After a quick shakedown the Moose started working on making the 3 critical laps that will determine if the Moose will be able to get in the field with over 60 cars angling for the top 30 spots. Due to the abrasive nature of the track at 5 Flags the qualifying efforts required numerous tire changes, gear changes and setup tweaks. And because the nose of the G-Force Fusion was taped up to create additional down force an engine cool down period between attempts made for a long day. During the regular season the Moose was one of only 2 drivers to qualify under the 17 second mark and duplicating that effort will be critical in making this years field. 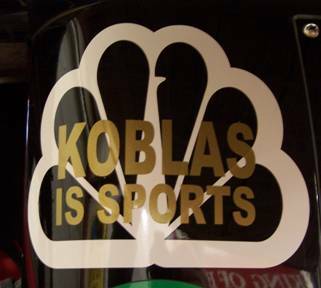 Thomas Praytor, the Moose, will run a special �Koblas Is Sports� sticker on the B post of his car for the 43rd Annual Snowball Derby at Pensacola�s 5 Flags Speedway. Visitation will be from 5 p.m. to 8 p.m. Sunday and 9 a.m. to 10 a.m. Monday at Mobile Memorial Gardens Funeral Home, 6040 Three Notch Road. Graveside services and interment will be held at 10 a.m. Monday in Mobile Memorial Gardens. 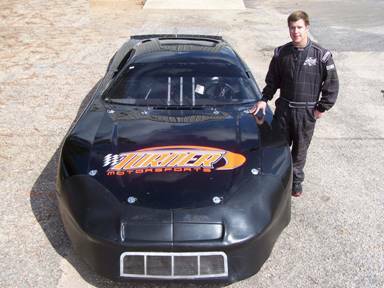 Thomas Praytor 2010 Derby 11-22-10: Open testing at Pensacola�s 5 Flags Speedway on Saturday marked the 2 week countdown to the 43rd Annual Snowball Derby. 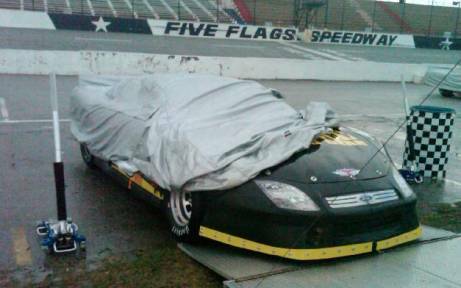 For the first time our Max Force Team unloaded 2 late models for testing, a Pro Late Model for Saturday night�s Snowflake and a Super Late Model for Sunday�s Snowball Derby. The team has been working clandestinely on installing a Super motor in the Turner Motorsports car that wasn�t supposed to be ready until the 2011 season. Thomas, �Everybody knows my Dad is not right and he decided a couple of weeks ago that we should run both cars at the Derby. Our number 1 problem was we needed a motor. 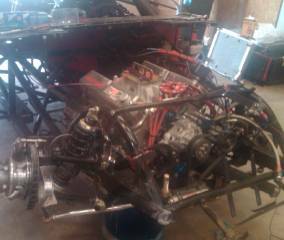 Well, I have friend who�s Dad races in NASCAR and while his Dad was away at the races another guy I know who races in ARCA went by their shop and the next thing you know a motor was sitting on the floor of our shop. 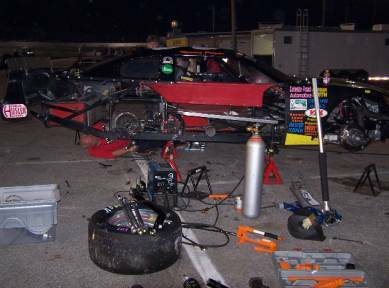 My story is the motor fairy brought it!� Our Turner car was setup for a Pro-Late model and our team was now in overtime mode getting the car ready for testing. During the ramp up we decided to change the paint scheme a little so it would be easier to tell the 2 cars apart (see picture above). This wasn�t done for the fans but for our team and most importantly our driver so he would know which car to get in. Off the trailer the Moose was back on familiar footings as he man handled the Pro-Late Model around the old worn out surface at 5 Flags. The Super car was a different story. Thomas �I was everywhere but wow was it fun!� Unfortunately an issue with the motor that we can�t get repaired before the Derby cut the practice time in the Super car short and the Super will have to wait until the 2011 season. �We�d spent a lot of time getting the Super car ready and it�s a little bit of a let down that we aren�t going to get to race it. That having been said we were really stretching our team resources to ramp up a Super program in such a short time. With the Super in the trailer we really got to spend some extra time with Christine.� The team has a private test planned for Saturday, with the race haulers moving in on the following Wednesday. Thomas Praytor Mobile 10/27/2010: With a little time off before the Derby the Moose spent a morning with Sheriff Sam Cochran and members of the Sheriff's SWAT Team at their training facility at Big Creek Lake. While the Moose is proficient behind the wheel of a stock car, he proved he's not the guy you want behind the Glock 9 millimeter when surrounded by the bad guys! Thomas, "I really appreciate Sheriff Cochran letting me take part. I've grown up with the deputies at Mobile International Speedway and it was awesome watching them in action! I had fun with the machine gun but I've got a long way to go to catch up to the SWAT Team. I took a turn in the shoot room and they say the guy coming at me with the 2x4 would have beaten me to death before I finally pulled the trigger. Getting a little taste of what our guys go through really makes you appreciate the job they do for us. Now if I just convince my Dad to take it easier on them at the race track!" 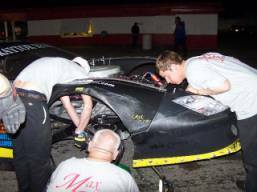 Thomas Praytor 9-24-10: With a few weeks off between starts the Moose saddled up a giant hamster and tested his Ed�s Seafood Shed Fusion at Mobile International Speedway. Herbie the Hamster was the master of ceremonies for B & B Pet Stops annual Herbie Derby last Saturday (picture top left). After some fierce competition, Caroline Knowle�s hamster �Daisey� owns the title as Mobile�s fastest hamster. 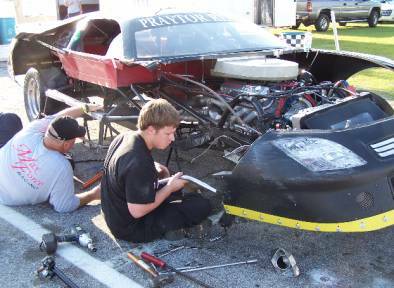 With the hamsters behind the Moose the team went to work on curing the brake issue that sidelined Christine at the Lee Fields Memorial 150. The Miller Lite Super Late Models will be racing at MIS tonight and the track was open for practice on Thursday. With a free shot at testing, our Max Force team tried a completely different setup package and tried to abuse the fresh brake system to see if we had it fixed. After a long night of testing the crew rolled Ed�s Sled back in the trailer wishing they were racing this weekend. 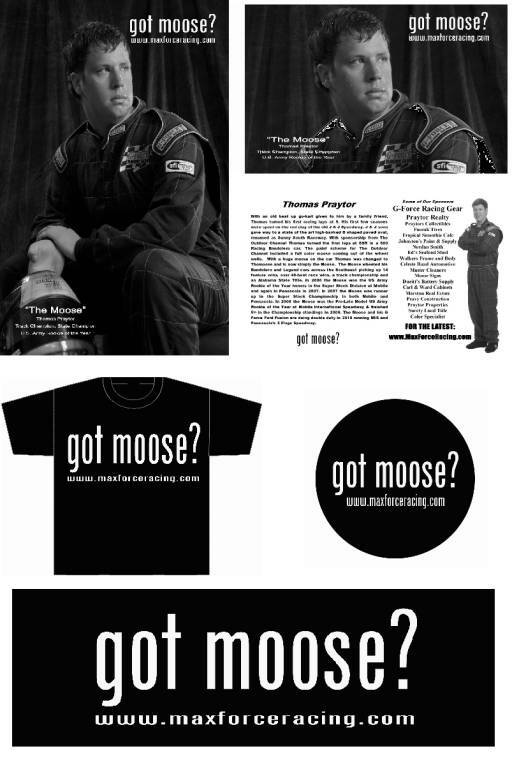 MOOSE, HAMSTERS AND ED�S OH MY! Thomas Praytor 9-16-10: Normally, putting together a bunch of Hamsters with Mobile�s best seafood is not a very good idea but the Moose, Hamsters and our Ed�s Seafood Shed Fusion will all be at B & B Pet Stop on Saturday afternoon for their annual fundraiser for the Mobile County Public Schools. The Trufant�s host the Herbie Derby with hamsters vying for Mobile�s fastest hamster title. The green flag drops this Saturday at 3:00 PM at B & B Pet Stop on Cottage Hill with all the proceeds going to help our school system. 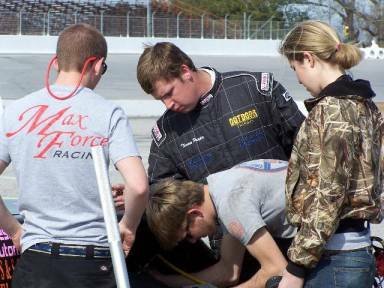 Thomas Praytor Lee Fields Memorial 150 9-4-10: With 15 minutes of testing on a car that was a bare chassis 10 days before the Moose and our Max Force team rolled into the biggest race of the 2010 season at Mobile International Speedway. Unfortunately our team had been in this spot too often this season but each time Christine had returned from the Grill�s Grand American Race Car shop in Dolomite, Alabama just as good if not better than before. In Friday night�s practice session Christine was solid as a rock and our Ed�s Seafood Shed Fusion was ready for Saturday. During Friday night, obviously after too much Pit Party, the Toilet Paper Bandit aka Head Techman Ricky Brooks struck our hauler. Our Ed�s Sled had been so good on Friday night we experimented with some other setup options during Saturday�s practice session. The toilet paper was an early indicator of what we turned our car into. After banging our heads against the wall for an hour of practice we put back what we had underneath Christine on Friday night. A bad gear selection cost the Moose a couple of tenths in qualifying and he would roll off outside of the fourth row in 8th. With the drop of the green flag Ed�s Sled was hung up on the outside lane and looking for a way to get down to the preferred groove. Finally able to get down in the 10th spot the Moose started marching to the front. By lap 25 the Moose had rumbled in to the top 5, behind the new MIS Champion, the MIS Super Late Model Champion and 2 drivers who�s last starts were in the NASCAR Camping World Truck Series. Not too bad for a car that was a bare chassis just 10 days before. Cruising in the top 5, Christine started to turn wicked on the Moose by lap 40. At first it appeared a tire was going down because the car wouldn�t turn in the corner. A caution let the team come to pit road to check the tires and all 4 tires were good. Back on track the Moose was trying to diagnose the problems with his car while passing cars on his way back to the front. As the laps progressed the handling issue got worse as the Moose lost the brakes on his Ford Fusion. After several attempts to get to the bottom of the issue during cautions on pit road we reluctantly parked our Ed�s Seafood Shed Fusion. An inspection of the car after the race pointed to the brakes as the issue with the car all along. As it turns out, a piece of debris was lodged in the left front brake caliper not allowing the brake pads to close on the rotor. Inside the car, Thomas was getting a firm brake pedal thinking he was applying the brakes but in fact was not. Trying to make a car turn is tough, trying to make one turn with no brakes is impossible. Our team is already working on repairing the brake system, which is a heck of a lot easier than rebuilding the car! 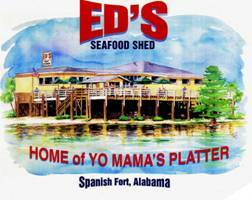 Pictures: (Top) Moose and crew on left and Ed�s Seafood Shed hood on right. (Middle) Papered hauler with the Toilet Paper Bandit caught red handed. 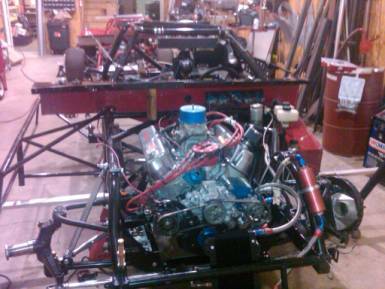 (Bottom) Ed�s Sled ready to roll. LEE FIELDS 150 WEEKEND IS HERE! Thomas Praytor Mobile International Speedway 9-3-10: It took our Max Force Racing team less than 10 days to take Christine from bare tubes to testing at Mobile International Speedway last night. With sponsorship from the home of �Yo Mamma�s Platter�, Ed�s Seafood Shed, our team unloaded Christine at 7:20 last night for what was to have been a 5:00 to dark practice. Even though the clock was ticking at the track the team took the extra time to attend to every detail on rebuilding our Ford Fusion. After a quick shake down to make sure all the pieces of our big jigsaw puzzle was back together, the team took a collected deep breath and the Moose dropped the hammer. With nightfall closer than what we wanted to admit to the Moose was rumbling around the familiar confines of Mobile International Speedway. 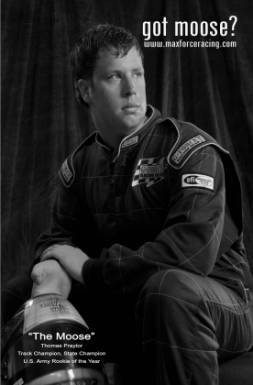 With only 10 laps of practice the Moose was turning laps times faster than the last race at MIS. Tonight starts a 2-day program for the Lee Fields Memorial 150, with practice from 5-9 with a track sponsored Pit Party following practice. Tomorrow the teams check in at 1:00 for technical inspection, practice and a full night of racing for all the classes at MIS with the Lee fields Memorial 150 for the Midwest Cooling Towers Pro Late Models. The 150 lap race is the longest race in the history of the Pro Late Model division at MIS and will test man and machine on Saturday night. 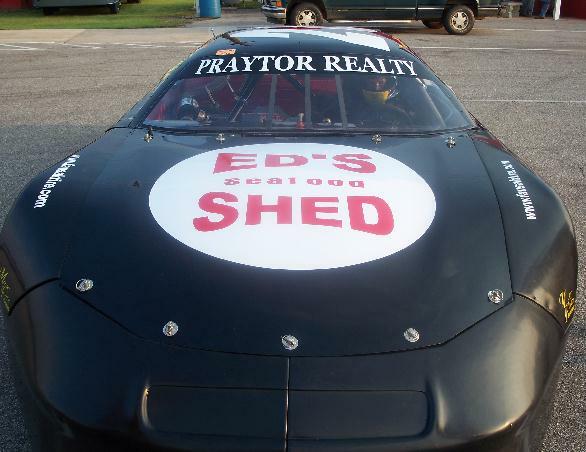 Thomas Praytor Mobile 8-23 10: With less than 2 weeks to go before the Lee Fields Memorial 150 at Mobile International Speedway, Christine returned from her latest facelift at the Grill�s Grand American Race Car facility in Dolomite. Alabama. Hard at work over the weekend our team has an aggressive game plan that will take the bare chassis pictured above to testing at MIS in just 8 days. While Christine has been at GARC other components have been tested, replaced or repaired and are ready for installation. For the first time the Lee Fields Memorial will be 150 laps, the longest race in the history of the Midwest Cooling towers Pro Late Model division at MIS. Testing a freshly put together car will be critical in prepping for 150 laps versus a normal 40 lap Saturday night shootout. While we�re working towards the Labor Day Lee Fields Memorial the Speedway is preparing for the return of the TBARA Winged Sprint Cars this weekend. Thomas Praytor 8-13-10: After another airborne adventure at Mobile International Speedway our G-Force Ford Fusion is back on it�s way to chassis builders Frank and Augie Grills for another facelift. Nicknamed Christine, after Stephen Kings novel about a car that has an amazing ability to regenerate itself, we may have to rename it Joan Rivers if it gets another facelift. 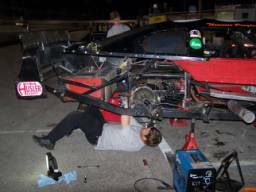 While our chassis is in Dolomite, Alabama our team is working on the rest of the pieces so they�ll be ready to bolt back on when Christine returns to our Max Force Race shop. 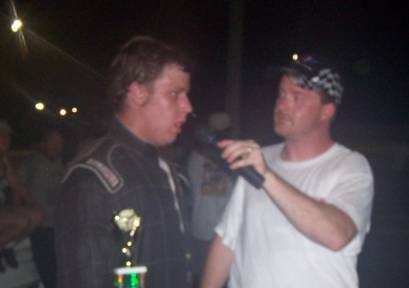 We�ll be in a full court press to be ready for the Lee Fields Memorial 150 on Labor Day weekend. While the Moose is off this weekend racing is full throttle this weekend with the Super Late Models at Pensacola tonight and Mobile International Speedway tomorrow night. 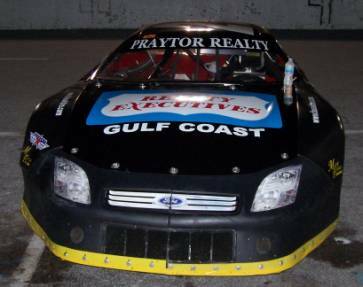 Thomas Praytor Pensacola 7-30-10: With the beaches open and Summer in full swing the Moose rolled his Realty Executive Ford Fusion off the trailer at Pensacola�s 5 Flags Speedway looking for some racing action as hot on the track as it was outside. Tight off the trailer, a bad gear selection relegated the Moose to a 6th place starting position. After some hot racing action in the first 5 laps the Moose settled into 5th and the top 5 separated themselves from the rest of the field and by lap 30 had 20 car lengths on the rest of the field. In the last 10 laps our Realty Executive Ford lost grip off the corners and the Moose lost ground to Tennessee�s Clay Alexander and Georgia�s Bubba Pollard but continued to put distance on the rest of the field. A rare 1-caution night at 5 Flags. Thomas: �The heat messed us up on our qualifying gear and we just didn�t have the type of qualifying effort we were looking for. 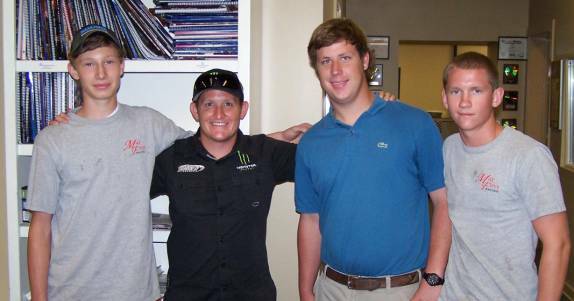 In race trim our Realty Executive Ford came to life and we had lot of fun racing with Clay and Bubba. Last race we had a good 20 lap car, this weekend we had a good 30 lap car, we�re gaining on it. We tested at Mobile on Thursday night and since we don�t have to rebuild the car we�re going to get some sleep and be ready to go!� Saturday night is Kids night at MIS and the Moose and our Max Force Team will be giving out �Got Moose?� Frisbees to the kids. Picture: A rare sight at 5 Flags, post-race a complete racecar! Picture: The Moose putting his Realty Executive Ford Fusion through it�s paces at Mobile International Speedway. 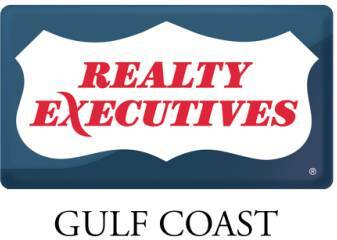 Realty Executives International, Inc. is one of the fastest-growing real estate franchises in the United States, with nearly 11,000 sales associates and more than 600 franchises. The Phoenix-based, privately held company has offices in the United States, Canada, South Africa, Mexico, Costa Rica, France, Greece, Panama, Nicaragua, Belize, Israel, Australia, Poland and Spain. Publications like Entrepreneur, Success and Inc. magazines have recently ranked Realty Executives International as a leader in the real estate industry based on franchise growth, management stability and financial soundness. For additional company information visit www.RealtyExecutives.com. Thomas Praytor Mobile 7-17-10: After a productive test at Mobile International Speedway on Thursday night the Moose rolled his Fausak Tire Ford Fusion into MIS expecting to be good off the trailer. For a rare moment reality lived up to expectations as the changes worked on in Thursday�s practice were paying dividends on Saturday. The crew put in a meticulous performance in practice and prepped our Ford for qualifying. The Moose got all he could get out of a snug car in qualifying and timed in the 3rd position. The race got off to a rare uneventful start and the Moose settled in to 4th with a car that had turned flat out tight, not just snug as it was in qualifying. On lap 7, Elliott Massey and the Moose were racing nose to tail when Massey�s motor exploded on the front straight away. Like a Jimmy Buffett song the Moose was covered in oil and instead of strummin the Moose was slipping and sliding and trying to avoid Massey�s spinning machine. Somehow the Moose kept from being collected and kept his Ford going forward. While the car was in 1 piece the windshield was like all of those tourist covered in oil. To clean it, the team would have to give up the 3rd position, while making laps under caution the Moose decided he�d rather look through the oil covered windshield than give up track position. In hindsight we would have been better off cleaning the windshield and taking up the tail end. On the restart the car in front of the Moose spun his tires and didn�t go, the Moose had a full head of steam and dove low to miss the stalled car. As the Moose dove to the The dive to the inside wasn�t enough and the car behind pile drived the Moose from the rear. That�s when things really got interesting, the shot from behind launched the Moose up and over the left rear of the car in front of him and the Moose was now on 2 wheels as he was pushed down the side of the other car with his right side wheels taking out the roof. Still getting some help from behind the Moose cleared the roof made a right hand turn on top of the hood, flirted with barrel rolling down the front stretch but thankfully didn�t and came to a rest after whacking the front stretch wall. Another fast car that needed a wrecker to get back to the trailer. Picture: Post race, oil covered windshield. Thomas Praytor Pensacola 5 Flags Speedway 7-13-10: The Moose and our Max Force team will skip 5 Flags on Friday night and will only compete at Mobile International Speedway on Saturday. The tracks have instituted a special set of rules for this weekend that put our small Mobile based team at a significant disadvantage at 5 Flags. Team owner Tommy Praytor made the call: "It's just a shame. You would think when we're struggling to get cars and fans to the racetrack that track owners would do what they can to help keep racers coming. This weekend the tracks are impounding tires instead of letting teams get tires in advance. Since our team consist of me and Thomas on Friday afternoon, until everyone gets off work, it's takes a lot of preparation for us to race at 5 Flags. Tires are a big part of that process. We've tried to work with 5 Flags on a compromise but they wanted no part of it. All we asked for was to let the teams, all the teams not just ours, mount and match tires during Thursday nights practice and leave them in the impound area for Friday night's race. We made a commitment to run the regular show at 5 Flags before the season started and have worked hard to promote 5 Flags and work with them as a partner, you know we're in this together kind of thing, or that's what we thought. We've done everything we can to help promote 5 Flags including a day-long event for school kids and we even stayed and handed out hundreds of free gifts to the fans after we destroyed our car in practice. It�s the tracks prerogative to make the rules and as a car owner it�s my job to make sure that we have a fair shot at competing under those rules when we roll in the gate. We�ve been racing at a disadvantage all year after the tracks added 50 pounds to our Ford before the season started. I�ve protested any changes to last years rule package that produced 15 different winners in 18 races but that fell on deaf ears. After management �tweaked� the rules package, this years results speak for themselves, we�ve had 10 races and one guy has won 7 of them (Of the 3 he didn�t win, 2 he wrecked and the 3rd he was in a borrowed car) and the same car has won every pole. Why is anyone still adding weight to this car? Even though we thought any rule change to the class was ill advised and the 50-pound weight addition was grossly unfair, we decided to compete anyway, as racers we want to race. We asked for a little help for all the teams in helping make this weeks specials rules show and again it fell on deaf ears. The tracks on the coast are struggling to put a dozen Late Model cars on the track and 2 hours up the road they have over 30. When you talk to racers that used to race on the coast but are now racing elsewhere, they say it�s because they are listening, changing and helping bring their cars to the track. Listening, changing and helping, a unique approach to a successful business model. You just have to wonder how much longer will management continue to put it�s head in the sand. The days of listening, doing nothing and making it harder or over, it�s time for listening, changing and helping." Instead of a doubleheader weekend the Moose will run a single header at Mobile International Speedway on Saturday night. 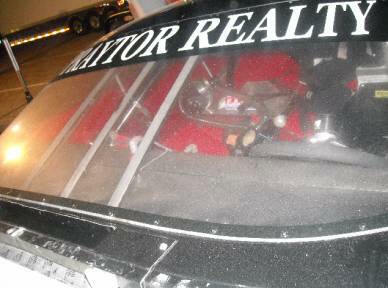 Thomas Praytor Mobile 6-12-10: After a top 5 in Pensacola on Friday night and not a mark on the Fausak Tires Ford Fusion our team had a chance to tweak on Christine instead of rebuilding. �We made a few changes to our Mobile setup in the shop and they paid off at the track. 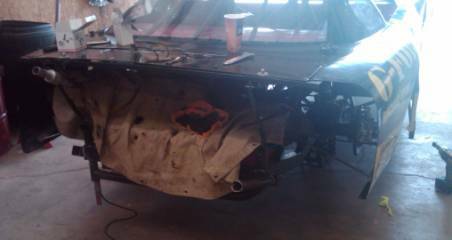 Our Fausak Ford was good off the trailer and the guys made it even better,� said Thomas. The Moose qualified 3rd behind current points leader DJ Vanderley and former Sprint Cup driver Dave Mader. At intermission MIS hosted round 2 of the weekends bicycle races, well the picture says it all. Thomas Praytor Pensacola 6-11-10: After weeks of no stop work it was time to get down to business Friday night in the round one of a Gulf Coast double header weekend. A frustrating practice on Thursday led to more frustration but some signs of life in the short practice sessions on Friday before qualifying. Our Max force team kept throwing changes at our Fausak Tires Fusion and we were determined to keep at it until we came up with something that worked. A new set of changes and the team pushed Christine into the qualifying line. �After struggling for 2 days we finally had our Fausak Tire Ford rolling the corners,� said Thomas. �It got to feeling too good to me on the money lap of qualifying and I overdrove the first corner costing us a few spots.� Even with an over anxious qualifying lap the Moose timed in the 5th spot. 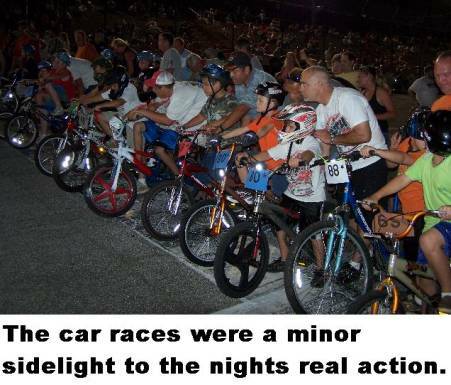 Before the race started the real excitement for the evening was the kid�s bike races. After the kids put on a show it was time for the Moose and the Pro-Late Models. After weeks of fast cars and no results our team took a different approach to Friday nights race at 5 Flags, finish. With the drop of the green flag the Moose was lurking to move to the front but was being throttled back from the spotters stand. 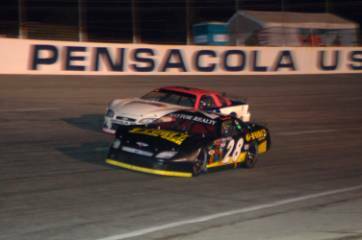 A smooth move to avoid a wreck on lap 2 was the beginning of changing the Moose�s luck at Pensacola. The first half of the race, 2,3,4 ran nose to tail with the Moose running at half throttles at times to keep from pressing the issue with the 3rd place car. A caution at the halfway point bunched the field back together and it was time to press the issue and move forward. While the Moose was ready to go, Christine had lost grip to the rear wheel and the Moose went from the hunter to the hunted. The Moose fended off the 5th place car until the Fausak Tire Fusion slid up off of turn 4 and the Moose slid back to 5th. With just a few laps left the Moose was able to hang on for a top 5 and for the first time this season a complete racecar at the end of a Pensacola race. The Moose and the Fausak Tires and Service Ford Fusion will be back in action tonight at Mobile International Speedway for round 2 of the doubleheader weekend. Thomas Praytor Pensacola/Mobile Testing 6-11-10: It took a total of 4 weeks to take every moving part of the Fausak Tires and Service Ford Fusion, have the chassis repaired and then put every moving part back on. After such an extensive rebuild the first few laps at speed are cause for a little anxiety. 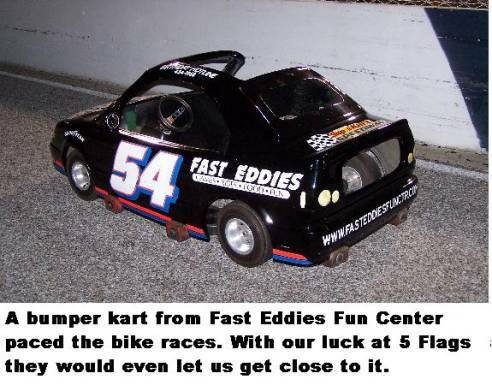 The weeks of preparation paid off as Christine was put the through it paces Thursday night at Pensacola�s 5 Flags Speedway. After the last race, not having anything fall off and not hitting anything was a good start. The Fausak Tires And Service Ford Fusion is slated to race at Pensacola�s 5 Flags Speedway tonight and Mobile International Speedway tomorrow night. 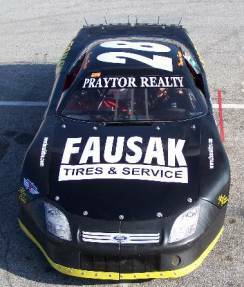 Picture: Fausak Tires & Service Ford Fusion testing at Pensacola�s 5 Flags Speedway. 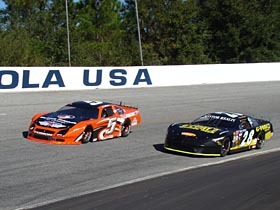 Thomas Praytor 5-26-10: The Miller Lite Super Late Models Series will take center stage this weekend at both 5 Flags and Mobile International Speedway giving the Moose and our Max Force team a much needed gap in the 2010 schedule. The 4-week span between starts gives the team time to take our battered Midnight to Frankie and Augie Grills Grand American Race Car shop in Dolomite, Alabama. The Grill�s have brought our car back to life more times than a vampire in a Twilight movie. Some track officials have started calling our car Christine, from the Stephen King movie. It leaves the track on Friday crushed and it shows back up in Mobile on Saturday night ready to race. Hopefully, the second half of the season will be kinder to our G Force Ford Fusion and our parts department than the first half. Picture: Bare chassis being loaded up for Grand American Race Car shop. Thomas Praytor Pensacola/Mobile 5-12-10: After having another fast car with heartbreaking results, the Moose and our Max Force Team have been preparing our G Force Ford Fusion for a big Pensacola/Mobile doubleheader weekend. 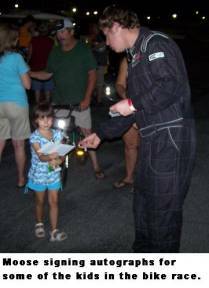 5 Flags Speedway kicks off the weekend with their annual �Meet the Drivers Night�. Fans are invited down to the front stretch to visit with the drivers and their teams. The huge fan favorite event is the perfect time to introduce the new Got Moose? campaign. Posters (picture above), hero cards, t-shirts, huggers, bumper stickers, stickers and frisbees will be free to the fans on Friday night. For a Got Moose? fan pack drop us an email with your address. 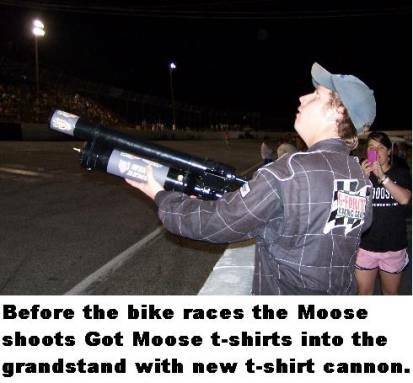 After the fans go back in the stands the Moose will be trying to toss the huge monkey (could be reaching Gorilla size at this point) off his back from the last few races on the coast. The Moose has clawed his way back into the top 5 in the point�s standings at Mobile International Speedway and is just 1 point out of the 4th spot. Saturday night he�ll be trying to improve on that position and move back into the top 5 finishing order. GLOOM DESPAIR AND AGONY ON ME��. Thomas Praytor Pensacola 5-9-10: In the immortal words of Hee Haw�s, Buck Owens and Roy Clark- Gloom, despair, and agony on me, Deep, dark depression, excessive misery, If it weren't for bad luck, we'd have no luck at all��. behind the Moose. 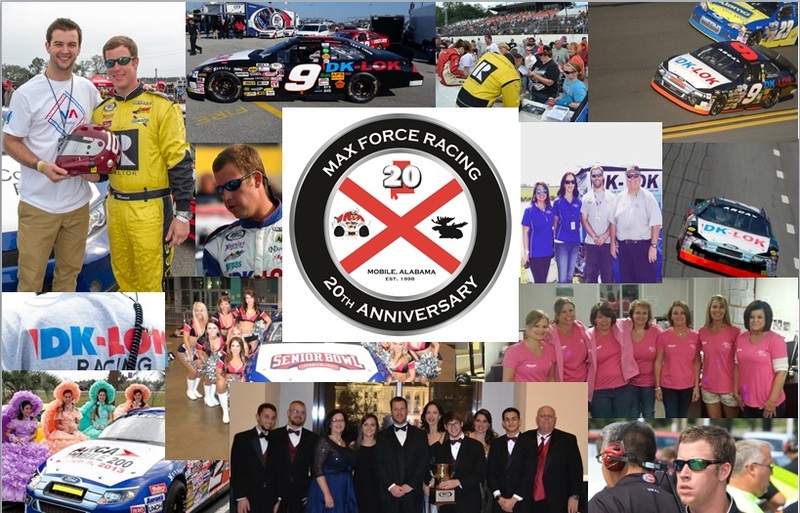 The Moose and our Max Force team are already getting ready for another double header weekend and Meet the Driver night at Pensacola�s 5 Flags Speedway on Friday night. Thomas Praytor Pensacola 5-6-10: Pensacola is making a rare Mothers Day weekend start on Friday night making up for the rain date last weekend. The Moose spent Thursday at 5 Flags with a 100 middle schoolers from Baldwin County as part of their reward for excelling in reading. Thomas, the Sunoco Gulf Coast Champion Johanna Long, 5 Flags Champion Ronnie Smith, Modified drivers Nathan and Bobby Engersoll and Derrick Johnson spent the day with the students. 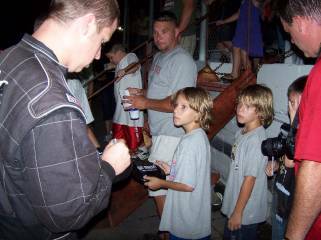 The kids climbed inside the cars to get a view from the drivers seat, picked up some autographs followed by a taste of race night. 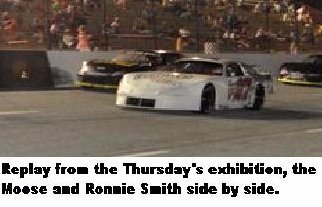 Part of the days activities was a 6-lap �exhibition� race with the Moose and Ronnie Smith. Waving the green flag in front of those 2 is like waving a red flag in front of a bull. The tell tale rev-limiter chip gave away how fast an �exhibition� the pair were putting on. Both crews and track owner Tim Bryant all breathed a collective sigh of relief with the waiving of the checkered flag. After the �exhibition� the Moose, Smith and Long gave the kids a ride in the pace car and pace truck. With the kids loaded back on the buses the Moose got down to business testing for Friday night. 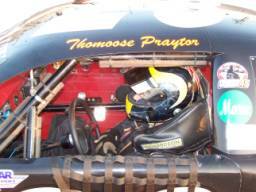 Thomas Praytor Mobile 5-1-10: After the disaster 2 weeks ago and the rainout the night before at 5 Flags the Moose was ready to rumble at Mobile International Speedway on Saturday night. Off the trailer our G Force Ford Fusion was bottoming out hard on the racetrack and the team worked to obtain the delicate balance of, as close to the track as you can be without hitting it. Even though the Moose has been close to the pole all season we are still tweaking our qualifying package and a new gear on Saturday night was part of that equation. Gears change how a car handles in the corners and the speed at the end of the straightaways, the gear selection for Saturday night tightened (the car doesn�t want to turn) Midnight up. Tight and bouncing off the track makes for an ill handling racecar. While the team was fighting handling issues other gremlins surfaced from the rebuild after the disaster 2 weeks ago. After the first practice the Moose noticed our just rebuilt rear end was too far back on the right side. The new right rear trailing arm bracket had broken its weld and spun pushing the right side of the rear end backwards. A port-a-power and a fresh weld had the rear end back in place and ready for the second practice. After the second practice the team prepped the G Force machine for qualifying and while straightening the steering wheel to set the sway bar the steering column snapped off in the Moose�s hand. Apparently the column had a hairline crack in it from the wreck and it finally broke. A problem in the pit, a broken steering column would have been a disaster if it happened on the racetrack. Fortunately we still had the welding machine out from the rear repair and without missing a beat the steering column was cut smooth and the steering wheel nut welded on the column. The problem with the quick repair was the steering wheel was now further away than before and would make for a different steering feel inside the G Force Fusion. Having to use the welding machine twice and we hadn�t even qualified was not a good omen. Even with the calamity of practice and the repairs the Moose missed the pole by just a tenth of second and he was 2 tenths faster than his last qualifying effort. The front of Saturday night�s field was so close that a tenth would put the Moose 4th and starting outside of the second row. With the drop of the green flag the outside row was freight trained by the inside line and the Moose would settle in to 5th. A missed shift by the leader on a restart scattered the field and put the Moose deeper in a hole trying to avoid running over the cars in front of him. The race took on a green flag look and went the distance without a caution. Under the long green flag Midnight became a handful for the Moose and our post race inspection found chunks of rubber out of the right rear tire. Pensacola�s reigning track champion, Ronnie Smith was able to slip by the Moose for the 5th spot and the Moose hung on for 6th. The 6th place finish put the Moose back in the top 5 in the Midwest Cooling Towers championship standings and just 1 point away from the 4th spot. Pensacola 5 Flags Speedway has been rescheduled for a special Mothers Day weekend race on Friday night. Picture: Crew thrashing on the G Force Fusion, port-a-power, welding machine and we haven�t even qualified. Plus you can�t see the guy under the car! Thomas Praytor 4-29-10: The Moose spent Thursday afternoon prepping for round 3 of the Pensacola/Mobile double-header weekends. Coming off of a brutal double header weekend 2 weeks ago, wrecked both nights on the first lap, the Moose and our Max Force team spent the last 2 weeks rebuilding the car from the wreck at Mobile International Speedway. Most of the parts used on Saturday night in Mobile were spares after the wreck in Pensacola on Friday night and what wasn't broken had to be replaced with front line pieces. New pieces required a trip to Grand American Race Cars in Dolomite, Alabama and a visit with chassis builder Augie Grill. A day at Grand American was followed by a trip to Alabama's biggest track to lend a helping hand to Mobile's Grant Enfinger. Enfinger leading the most laps at Talladega shined a bright spotlight on the quality of racing on the Gulf Coast. 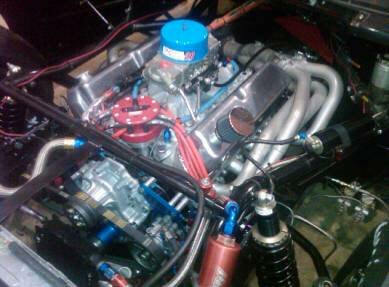 After Talladega our G Force Ford Fusion was stripped down and rebuilt from the inside out. A rebuild of all the suspension parts leaves a lot of questions that were answered as the Moose wound Midnight's clock at 5 Flags. Within a few laps Midnight and the Moose were like peanut butter and jelly. Five Flags on Friday night and Mobile International Speedway on Saturday night. Thomas: "I was really worried about what kind of car we would have. We took off almost every moving part and replaced it. Augie (Grill) did a fabulous job getting our rear end and shocks rebuilt. Having a Grill car has been a big plus for our program. I don't know if we have another 16 something lap in the car but I'm looking forward to trying. Congratulations to Grant and Hal (Martin 2007 MIS Champion finished 10th in Talladega) on their runs in Talladega. Good luck to Mr. Rick (Crawford) this weekend, it�s going to be tough not seeing the 14." (Pictures: left repaired and at the track in less than 24 hours, right back to work) had a long way to go the front with a car we were still struggling to find the handle on. On Saturday night we wouldn�t make the 1st turn as the competitor on the outside turned down into the right front on our G Force Fusion. 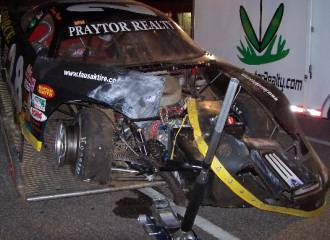 The contact snapped the strut on the right front wheel assembly and ended the Moose�s night on the first lap again. From the penthouse to the outhouse and repeat. Thomas, �I just couldn�t believe it, my right front tire mark was ahead of the guys number and he still came down on me. All the hard work everyone had done just seemed wasted. Riding back in the wrecker for the 2nd night in a row was like being in a nightmare that wouldn�t end. By the time they got the car back to the trailer my team was waiting on me with the parts ready to fix it, what can you say? They had worked all night, all day and we were out on the first corner and they were ready to get back to work. We had a horrible points weekend but I couldn�t be prouder of our team. Congratulations to DJ on double poles and double wins and Grant Enfinger on his run in Texas.� The team has 2 weeks to get ready for round 3 of the Gulf Coast Two Step. 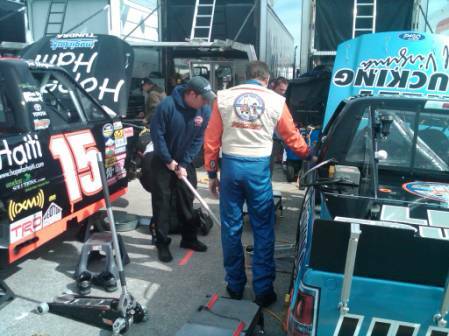 This weekend the Moose will be in Talladega to lend a hand to Mobile�s Grant Enfinger�s Beasley Allen ARCA car. 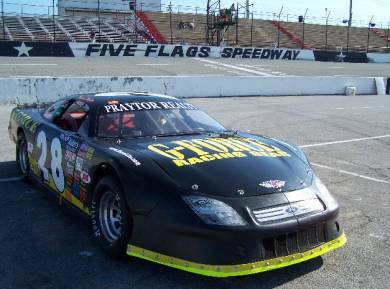 Thomas Praytor Pensacola/Mobile 4-15-10: After 3 weeks off the Moose prepped for this weekend�s doubleheader at Pensacola�s 5 Flags Speedway and Mobile International Speedway with a test yesterday afternoon at 5 Flags. 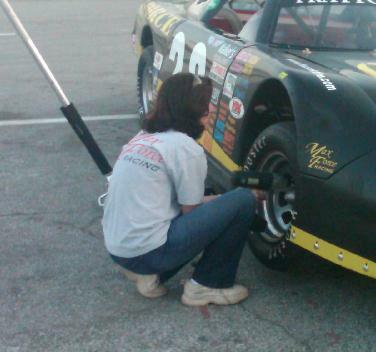 Volunteer crew can be hard to find for a daytime test during the workweek, so we even had Julie (Mom-nickname Chad) changing tires (picture). While the crew was a little slower than normal the Moose was not. With very little experience on long runs the team only used the tires from the feature from 3 weeks ago. Flat spotted and worn out the G Force Ford Fusion was a handful but let the Moose gain valuable on track experience that should pay off in the closing laps of tonight�s 40-lap feature. 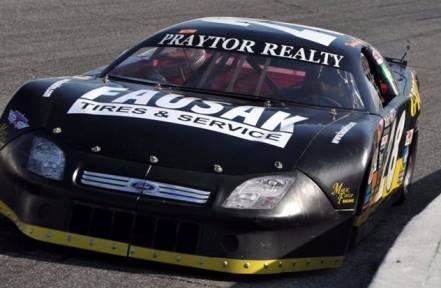 In addition to the Moose and the Midwest Cooling towers Pro-Late Models, the Praytor Realty Super Stocks will be in action on Saturday night at Mobile International Speedway. Mobile�s Grant Enfinger, set a new track record in qualifying yesterday to have it washed away when rain cancelled qualifying for the ARCA ReMax Series race in Texas. The field was et by points and Grant will roll off 14th. The race can be seen live on Speed at 6:30. Thomas Praytor Nashville, TN 4-5-10: The Moose should be enjoying 2 weeks off ahead of round 2 of a doubleheader weekend on the Gulf Coast in 2 weeks. Instead the Moose spent Easter weekend in Nashville as a crewmember on the Circle Bar NASCAR Camping World Truck Series team and this week is preparing to test his G Force Fusion at Mobile International Speedway on Thursday. Mobile and Pensacola were closed last weekend for Easter and this weekend will play host to round 1 of the Miller Lite Super Late Model Series. The Moose will roll back into action on April 16th and 17th. Thomas: �I really appreciate Mr. Rick (Crawford) and Blake (Bainbridge) letting me work with the team this weekend in Nashville. Every time I get an opportunity to work with them I learn so much. In our first race at Mobile our G Force Ford got a little tight at the end of the race. We�ve got some long run changes we want to try this week in Mobile so we can test at Pensacola next week. Picture: Moose preparing to catch tires during a pit stop at Nashville Superspeedway. 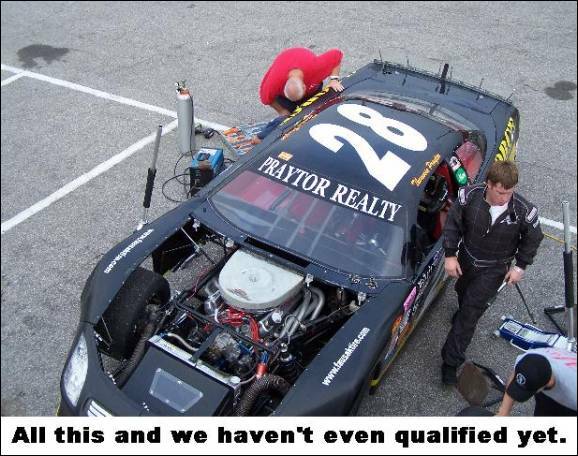 The Praytor Realty Super Stocks opened the season with a bang with the old track record being broken 3 times! Jessie Reid turned the best time and is the new track record holder for the rough and tumble division. The extended lap feature opened the 2010 season for the Super Stocks and after multiple lead changes Birmingham�s Paul Jean took home the win. 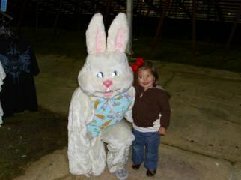 While the action was hopping on the track the Easter Bunny was handing out Easter candy for the kids from Praytor Realty in the grandstands. MIS is closed for Easter weekend and will be back in action in 2 weeks with round 1 of the Miller Lite Super Late Model Series. 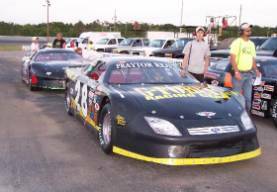 Thomas Praytor 3-25-10: All the prep all the hype goes out the window this weekend as the first Late Model Doubleheader weekend on the Gulf Coast starts tonight at Pensacola�s 5 Flags Speedway followed by Saturday night at Mobile International Speedway. The Moose and his Max Force team were at Pensacola�s 5 Flags Speedway last night putting the finishing touches on his G Force Ford Fusion. The Moose turned a lot of laps trying to get the feel of the cheese grater pavement at 5 Flags on old wore out tires. After slipping and sliding for 50 laps on old tires, the team bolted on a fresher set of old tires (Unlike NASCAR and high dollar late model teams, the Moose practices on old tires to save money. As a result we have different levels of used tires.) to wrap up the Thursday night practice session. Solid off the trailer to in the trailer the Moose is ready for double duty. 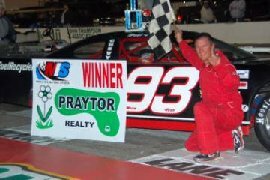 Thomas Praytor 3-22-10: The months and weeks of waiting are now down to days as the opening of the 2010 racing season is this weekend. The Moose opens the year attempting a double-header, Pensacola 5 Flags Speedway on Friday night and Mobile International Speedway on Saturday night. 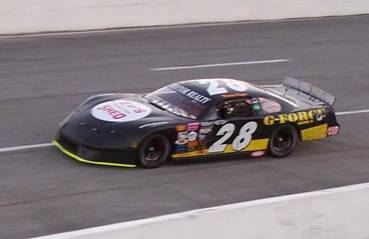 Double duty will be a common theme this year as the Moose attempts to become the Rookie of the Year at Pensacola�s 5 Flags Speedway and a coveted track championship at Mobile International Speedway. 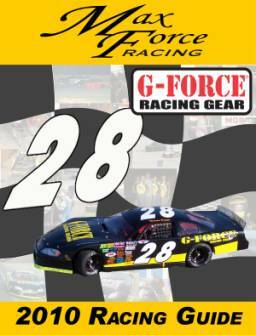 As we count down the days to opening night we are releasing our Max Force 2010 Racing Guide. The Guide consists of 30 pages of pictures, stories, track information, bios and much more about our Max Force race team. For your copy just drop us an email and we�ll get one out to you. 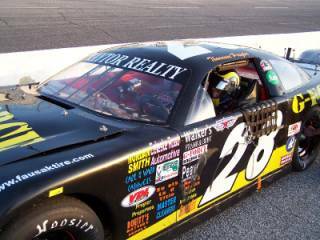 Thomas Praytor Pensacola/Mobile 3-15-10: For the first time in the modern era Pensacola�s 5 Flags Speedway and Mobile International Speedway hosted an open test on the same day. Our Max Force crew spent weeks prepping for the single day test at both tracks and had a solid game plan for the doubleheader. Two members of our all-volunteer crew were called to work on Saturday sending us into the busiest racing day of the year with 2 crew-members with an average age of 16. 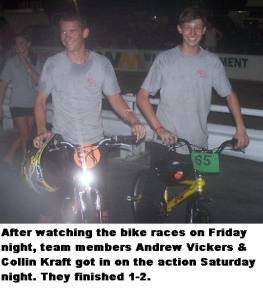 Andrew Vickers and Collin Kraft stepped up to the plate and performed like veterans. With dozens of teams testing on Saturday, the Moose and his Max Force team were the only Late Model team to test at both racetracks. After a couple of trips through Ricky Brook�s tech line, better known as the �Room of Doom� (It took more than 1 trip because we had some �issues� that needed to be fixed.) the Moose hit the worn out old pavement at 5 Flags Speedway. 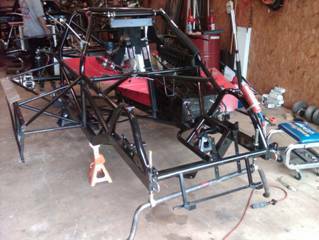 A new setup from chassis builder Augie Grill had the Moose quick off the trailer at Pensacola. During the morning we tried several different combinations to the G Force Fusion and the morning test went as planned. While the track was taking a lunch break we made the change over from our Pensacola setup to our Mobile setup. Shock, springs gears and a couple of other things we don�t want to print went into getting the car ready for Mobile. During the change over a piece on the rear end broke that required a stop at the race shop before going to MIS. Even with the stop at the shop we were at MIS just after they opened at 4 and ready to go. Back off the trailer the Moose was rumbling on the smooth high banks of Mobile International Speedway. As the test wore on our car just didn�t want to get up to speed like we had been the week before and everything we tried seemed to make it slower. A late change made us better but we left MIS disappointed with the speed of our G Force machine. In our post-test tear down on Sunday in the shop the culprit for the less than stellar performance was found in the rear end. The pinion gear had started to disintegrate and was within a few laps of coming apart completely. 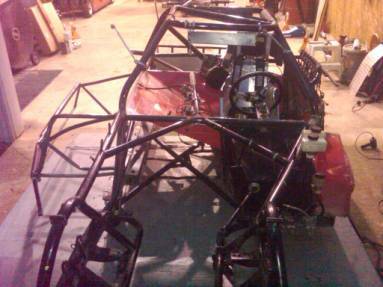 The team already has the rear end out and being repaired for the March 26/27 5 Flags /MIS double-header weekend. The Moose has this weekend off but the rumble on the Gulf Coast starts this weekend with a double-header opening weekend at 5 Flags/ MIS with the TBARA Winged Sprint Cars. Picture: (L-R) G-Force Ford Fusion going through Ricky Brook�s tech line, better known as the �Room of Doom�, 2 arm bands in 1 day-a rare happening on the Gulf Coast, Thomas and his team for double header test day, Collin and Andrew. 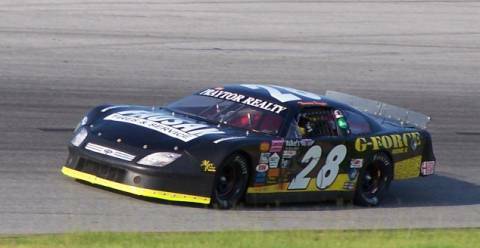 Thomas Praytor Pensacola/Mobile 3-112-10: As the days count down to the start of short track racing on the Gulf Coast, Pensacola�s 5 Flags Speedway and Mobile International Speedway are holding a historic single day double header test on Saturday. Most teams will pick one track or the other to prepare for the season opener but the Moose and our Max Force team will attempt to do both! Because our schedule calls for racing at 5 Flags on Friday night and Mobile on Saturday night we have prepared a plan for making the necessary setup changes to our G-Force Ford Fusion in a hurry. Saturday�s double-header will give our team the perfect opportunity to test our change list ahead of the Moose�s season opening weekend on March 26-27th. Saturday will also be the first time that Thomas will drive 2 tracks in 1 day, not just 2 tracks but 2 completely different tracks. Finesse and patience are the keys at 5 Flags while being on the verge of out of control is the key to being quick at MIS. This weekends test precludes the Winged Sprint cars opening the season at 5 Flags/MIS on March 19/20th. 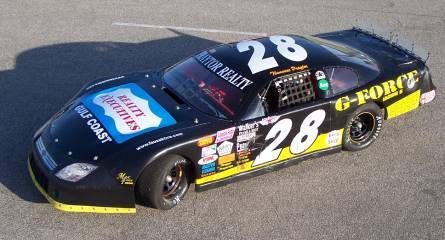 Thomas Praytor, Atlanta Motor Speedway-Mobile International Speedway: 3-8-10. 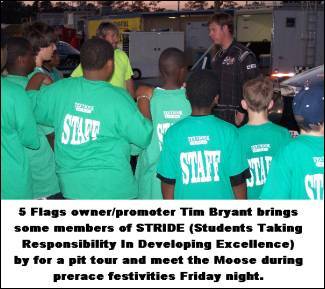 The Moose kicked off a busy March at Atlanta Motor Speedway working as a crew-member on Mobile�s Rick Crawford Circle Bar Racing Ford F-150. Watching the Mobile native wheel his F-150 into the top 10 on the high banks of Atlanta Motor speedway had the Moose on the juice for his season opening test at Mobile. 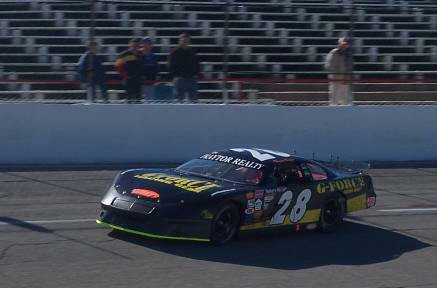 An off-season filled with tedious work on the G-Force Fusion paid dividends in our first time on the track this year. After a couple of laps to shake Midnight down, the Moose had Midnight�s clock wound up. One of the off-season changes was a new brake package from Brake Man brakes. The folks at Brake Man recalibrated our brake system and supplied us a with new front and rear brake compounds for the tracks we�re slated to run this season. The new brakes worked too well, changing the balance on the car and the team worked on keeping the nose of the car off the racetrack. After four hours of testing and tweaking the Moose was rumbling faster than he had ever been before. Our Max Force team will test 2 tracks in the same day this Saturday, Pensacola 5 Flags Speedway in the morning/afternoon and Mobile International Speedway in the afternoon/night. Throughout the season we�ll be doing double duty with Pensacola on Friday night and Mobile on Saturday night, Saturday will give us an opportunity to see how well we can make the changes to our car on the fly. Both tracks open with a double-header weekend on March 19-20 with the TBARA Winged Sprint cars, with opening night for the Moose a week later on March 16-17 with a double-header weekend at 5 Flags and MIS. 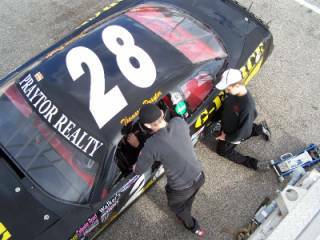 Thomas Praytor Daytona Beach, Florida 2-14-10: The Moose opened the first week of Speedweeks with Media Day and lending a helping hand to Mobile�s Grant Enfinger in the ARCA ReMax Series. The second and final week of Speedweeks the Moose went to work with the Circle Bar Truck Corral Team in the NASCAR Camping World Truck Series. Mobile�s Rick Crawford was making his 11th start, a series record, at the World Center of Speed and the Moose spent the week working with the team. 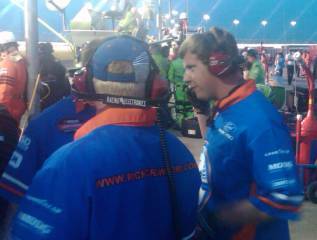 Thomas Praytor Daytona Beach, FL 2-5-10: The Moose started the 2010 racing season on the other side of the microphone during NASCAR�s Media Day at Daytona International Speedway. As part of Fausak Tires Inside Alabama Racing broadcast team, the Moose anchors the Moose Call every Wednesday night on WNSP. During media day the Moose garnered interviews with some of the biggest names in NASCAR for a special segment on Drivers first racecars to air in February. 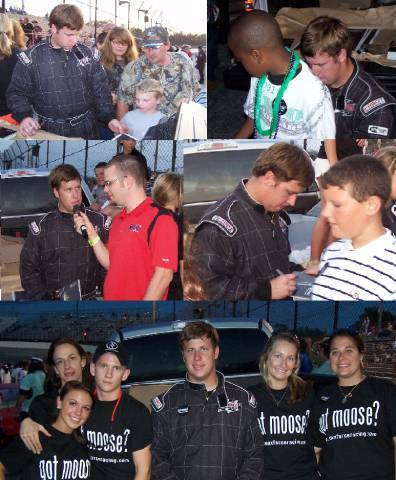 Kasey Kahne, Bobby Labonte, Denny Hamlin, Mike Bliss, Carl Edwards, Casey Mears, Tony Stewart, Martin Truex, Ron Hornaday, Marcos Amborse, David Reuttiman, Elliott Sadler, Kurt Busch, Rick Crawford and Michael Waltrip will be featured in a special My First Racecar Moose Call. Next up for the Moose, lending a helping hand with Mobile�s Grant Enfinger in the ARCA ReMax Series this weekend.